Robert N. Essick teaches English literature at the University of California, Riverside. 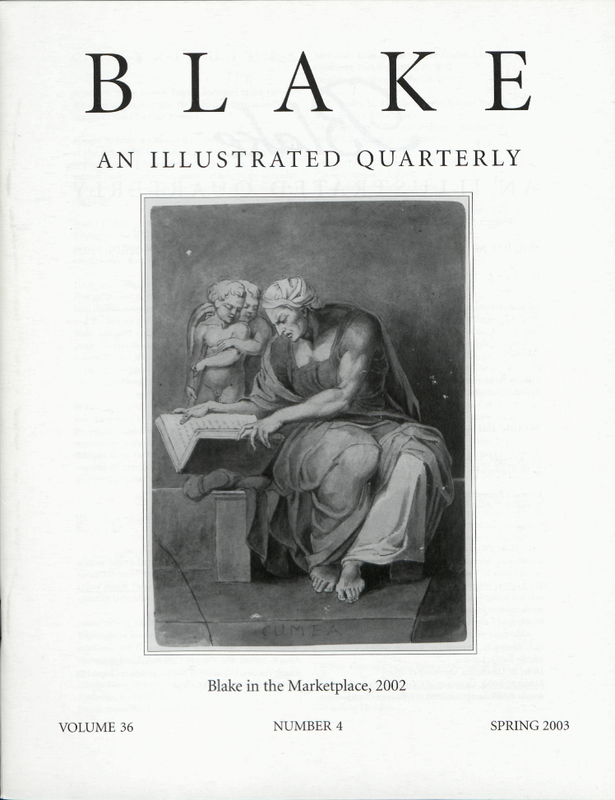 He has been collecting and writing about Blake for over 30 years. Eugenie R. Freed is a Research Fellow in English Literature at the School of Languages of the University of the Witwatersrand, Johannesburg, South Africa. Though her current project concerns women’s writing in the sixteenth and seventeenth centuries, her interest in Blake is still burning bright. Wayne C. Ripley is a graduate student at the University of Rochester. He is writing his dissertation on the relationship of The Four Zoas to Edward Young and eighteenth-century religious poetry. Jason Snart currently teaches English at the College of DuPage in Glen Ellyn, Illinois. His research focuses on William Blake’s marginalia and issues of materiality, textuality, and the history of book production. He has had work on Blake accepted in History of European Ideas, Visible Language, the Huntington Library Quarterly, and European Romantic Review. He has held research fellowships for study at the Huntington Library, the Yale Center for British Art, and at collections in London and Cambridge. William Stevenson, besides editing Blake: The Complete Poems (Longman: 1971 & 1989) and the Blake selection in the Penguin Classics series, among other things, has taught at universities in three continents, but has now retired from the battlefront. He still cannot escape Blake, and is at present working on a revision of the Complete Poems with the 2007 quarter-millennial anniversary in his sights. Cover: Cumea. A copy, attributed to Blake, of Michelangelo’s fresco of the Cumean Sibyl in the Sistine Chapel. Photo courtesy of Sotheby’s London.